A popular surface type for many school sports pitches and athletics facilities in the UK is the Multisport synthetic turf specification. This is a type of needlepunch artificial grass carpet which can be used for a number of outdoor sports areas including multi activity surfaces, football pitches and long jump runways. The Multisport synthetic turf is specifically designed to be a durable, all weather surface which is suitable for many different sports and activities. During the manufacturing process, the artificial carpet is needled together in a fibre bonded system which gives it both strength and porosity for use in all weather conditions. Once the surfacing has been installed to a sports pitch, silica sand infill is placed within the grass fibres to add extra strength and stability for each of the chosen sports. Some schools and clubs in the UK have multi use sports courts and athletics tracks installed in polymeric rubber surfacing. This is made up of EPDM rubber granules which are mixed together with a binder and then laid out onto a macadam sub base. Whilst this surface type provides good playing qualities for individual sports like netball and basketball, it doesn’t have the versatility that you get with a Multisport synthetic turf surface. What Makes Multisport Synthetic Turf Stand Out? 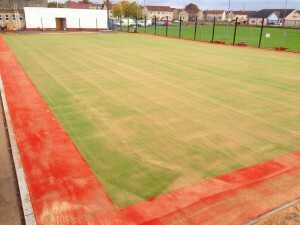 The Multisport turf is extremely strong and durable so it’s able to withstand heavy use by school students during PE lessons and after school clubs. The carpet is fitted with scrim reinforcement to prevent rucking so the surface remains smooth and even. Its fibre bonded design means it can resist damage from weathering and consistent use with a lot of different sports and activities as well as having a UV stable fibre to prevent colour fading. Because of the specialist needlepunch design, the synthetic carpet is able to provide optimum porosity as the manufacturing process results in free draining construction of the surface when compared with polymeric rubber and any of the other artificial grass specifications. This means that water is able to drain through the surface a lot more quickly without puddling, making it a true all weather facility so PE lessons and training don’t have to be cancelled due to wet conditions. The playing characteristics of Multisport synthetic turf mean that it’s arguably the most versatile surface type for outdoor games facilities. Sports which it can be used for include football, hockey, tennis, netball, basketball, athletics and a range of other playground games and activities during PE lessons and extracurricular clubs. Polymeric rubber surfacing can only cater for up to two or three sports so the needlepunch carpet provides a much wider variety of sports and activities for people to get involved in. We can install this artificial grass surface in a range of bright colours and designs to allow you to customise the look of the facility and created separate areas for different sports. Some schools choose to have athletics tracks installed in rainbow striped designs, whereas others have multi use games areas with different coloured sections for each activity. Line markings can also be inlaid into the surface for individual sports. In comparison to the EPDM rubber surface, needlepunch turf provides a much softer option which is ideal for primary school facilities where younger children are going to be playing, this is because it absorbs impact from trips and falls to prevent injuries. Polymeric rubber surfacing sometimes requires a layer of anti slip paint which is applied to enhance the playing qualities and improve safety. Over time these paint coatings can begin to fade and will need to be reapplied to bring back the original performance characteristics. This is an issue which you wouldn’t get with the needlepunch specification because, as long as regular care is given to the surface, the only reactive maintenance which might be needed will be topping up the sand infill or fixing minor tears to the carpet if it does sustain any damage. If you are interested in finding out more about the Multisport synthetic turf specification or you’re thinking about having a multi use games area installed at your school or club, please feel free to contact us. We can offer professional advice and design details for all of the facilities that can be installed in the needlepunch surfacing. One of our team members would be happy to discuss prices and budgets for your project so please fill in our contact form and let us know what you’re looking for so we can help.